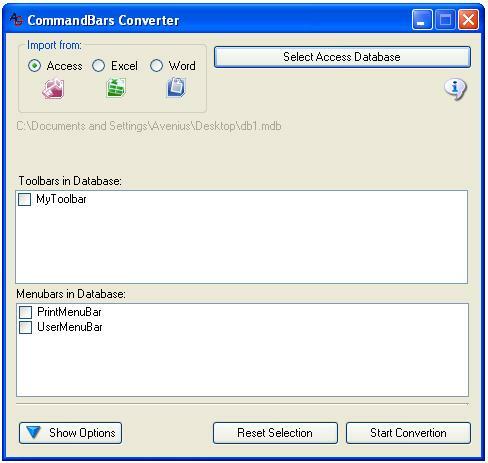 Is a converter for user-defined menus and toolbars from Access databases, Excel workbooks and Word documents to Ribbon XML for importing into the IDBE RibbonCreator 2016. After starting the program you may select from what kind of document you want to import your menu bar or toolbar. After a files selection the appropriate office program is briefly opened and the existing menu bars and toolbars will be displayed. 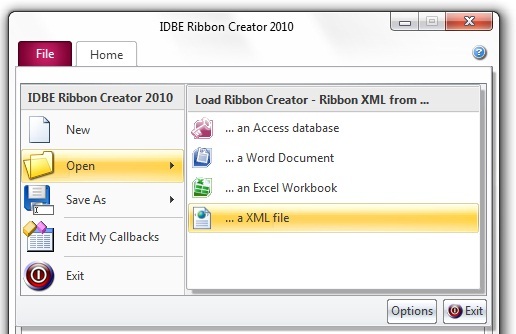 Select the desired menu bars and/or toolbars which you want to be converted to a Ribbon XML in the IDBE RibbonCreator 2016. Using the button „Reset Selection“ all selected menu bars and/or toolbars will be deselected. Clicking the button „Hide Options“ further options will be hidden. Clicking the button „Show Options“ further options will be displayed. Here you start the convertion of the selected Menu bars and/or tools bars with the requested options. Clicking the button allows you to define a file name for the Ribbon XML that will be created. A completion message will appear after conversion. to load und edit your converted XML file. User-defined menu bar and toolbar in a Office 2003 Program. For each menu in the menu bar / toolbar a new group on the ribbon tab will be created. For each menu in the menu bar / toolbar a new tab on the ribbon will be created. If a menu should be used on a menu bar and/or toolbar you may select what kind of Ribbon control you want to use. A menu control is used on the ribbon. A SplitButton control is used on the ribbon. 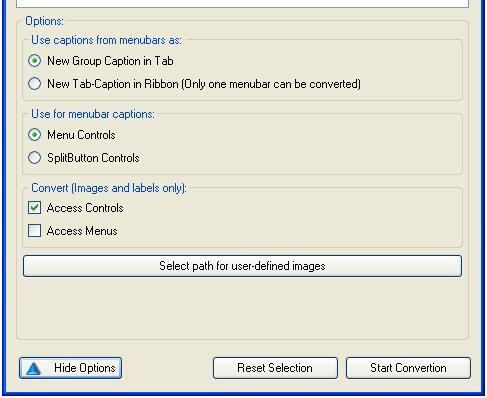 If built-in elements from Office programs (built-in menus and/or built-in buttons) are used with your user-defined menu bars and/or toolbars you may choose whether they should be converted or not. Only button elements will be converted, menus remain disregarded. Tip: User-defined buttons from Excel workbooks will only be converted if the option is checked. All menus including all buttons will be converted. Select a folder where the user-defined images will be stored. All images in the selected folder will be stored as an PNG bitmap with transparency. Tip: User-defined images from Excel workbooks could not be extracted. for support and co- development.